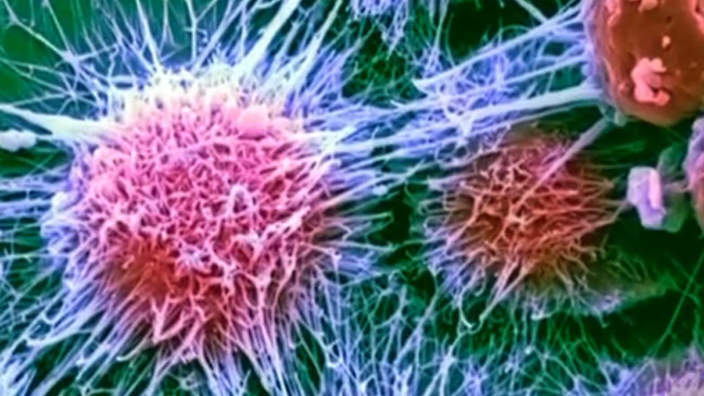 Researchers have developed cancer drug-packed 'grenades' armed with heat sensitive triggers, allowing for treatment to be targeted directly at tumours, according to two studies due to be presented at the National Cancer Research Institute (NCRI) Cancer Conference in Liverpool. The team based at the University of Manchester has been developing liposomes - small, bubble-like structures built out of cell membrane that are used as packages to deliver molecules into cells - to carry drugs into cancer cells. The challenge, as with any treatment, is to direct the liposomes and their payload directly to tumours while sparing healthy tissue. Two new studies show the team has taken a step closer to solving this problem by fitting liposomes with a heat-activated trigger. By slightly heating tumours in the lab and in mouse models, the researchers have been able to control when the pin is pulled so that the cancer-killing 'grenades' release the drug and target the cancer. Kostas Kostarelos, study author and professor of nanomedicine at the University of Manchester, said: "Temperature-sensitive liposomes have the potential to travel safely around the body while carrying your cancer drug of choice. Once they reach a 'hotspot' of warmed-up cancer cells, the pin is effectively pulled and the drugs are released. This allows us to more effectively transport drugs to tumours, and should reduce collateral damage to healthy cells. "The thermal trigger is set to 42 degrees celsius, which is just a few degrees warmer than normal body temperature. Although this work has only been done in the lab so far, there are a number of ways we could potentially heat cancer cells in patients - depending on the tumour type - some of which are already in clinical use." Professor Charles Swanton, chair of the 2015 NCRI Cancer Conference, said: "Liposomes are small bubbles of cell membrane that act like a cellular postal service, delivering molecules to our cells. Using them to deliver cancer medicines has been a holy grail of nanomedicine. But finding ways to accurately direct the liposomes towards tumours has been a major challenge in targeted drug delivery." "These studies demonstrate for the first time how they can be built to include a temperature control, which could open up a range of new treatment avenues. This is still early work but these liposomes could be an effective way of targeting treatment towards cancer cells while leaving healthy cells unharmed." Originally posted by Cancer Research UK.